The build-it-yourself light board will teach you the fundamentals of programming. We all know the importance of code. It's the backbone of computing, the internet and so much else we come into contact with on a daily basis. But learning to code is still a tricky and poorly defined pursuit. I've booted up Codecademy a few times, only to try a couple of courses and realise I have no idea what I'm doing. For people like me — of which I suspect there are many — what's the next step? How do you go about grappling with this seemingly foreign and impenetrable language? 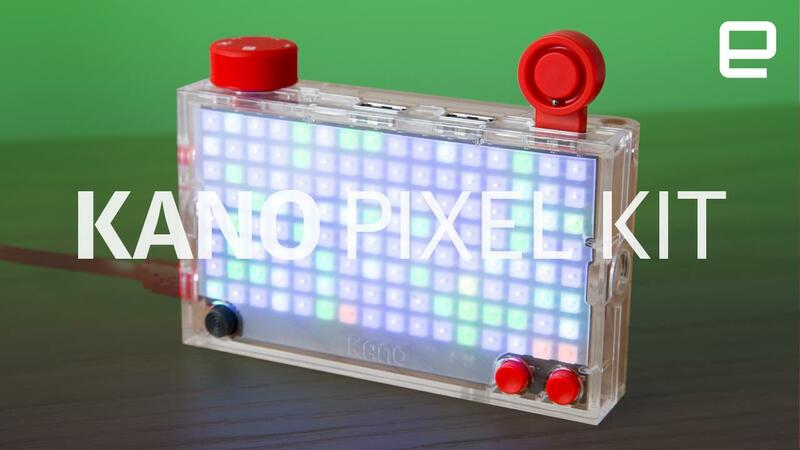 Maybe, just maybe, the answer is a colorful Kano Pixel Kit. Crack open the box and you'll find an assortment of colorful, approachable parts inside. The centerpiece is a custom board developed by Kano which houses a processor, a removable battery and microSD card, with three USB ports and one micro-USB slot for power/recharging. On one side is a grid of tiny lights that shine through a click-together transparent case. A Lego-esque booklet takes you through the construction process, which is fairly straightforward due to the limited number of parts. Attach a tiny joystick, a couple of buttons, a mode dial and voila! You're ready to code simple applications that come to life through the light board's LEDs. The Pixel is something of a successor to the build-it-yourself computer kit Kano funded through Kickstarter in 2014. That first product was built around the Raspberry Pi, offering a child-friendly introduction to the fundamentals of programming. Each box came with a board, a case, a wireless keyboard for typing commands, a speaker for sound, an SD card for storing projects and all of the cables you might need for power and connectivity. Once assembled, the user could boot up Kano OS, a version of Debian Linux that included a bright, cheery interface and educational apps. These taught you to make and "remix" classic video games such as Snake and Pong. With the former, you would learn how to change the size of the board and the number of lives at your disposal. In the latter, you would tweak the color of the paddles and the speed of the ball following a collision. The computer also shipped with a lightweight version of Minecraft that, long before Microsoft showed an interest in the game as an educational tool, came with some basic but nevertheless engrossing challenges centered around code. The Pixel kit is a slightly different concept. It's a physical device that you build, like the Kano, but then manipulate using a separate computer. All of your code is "written" and managed in the free Kano app for Macs and PCs. The software is a huge improvement over Kano OS, with cleaner, simpler iconography and menus. It's also faster, in no small part due to the hardware it's running on (in my case, a relatively new MacBook Pro.) The Kano-developed challenges still revolve around a series of puzzle-like pieces, which you pull from a list and slot together in different ways. Every shape represents a function and the app does a decent job of explaining their role within each project. You're never writing actual code, however. For some, who dream of getting lost in a Matrix-like stream of letters and numbers, this will be a disappointment. But there are good reasons behind the approach. Visual representations are more approachable for beginners and help to illustrate the larger, more fundamental principles that underpin modern programming. All "event" pieces, for instance, are light blue and usually signal the start of a chain reaction. So if you want something to happen as soon as the app launches, or when you press down on the joypad, you need to start with one of these pieces. It's a bold, intuitive piece of signposting that slips into your subconscious with greater ease than garbled words, slashes and dashes. The challenges slowly increase in difficulty, introducing new ideas only when the previous one has been firmly established and repeated. A text box in the upper left-hand corner explains the logic behind each step, while a yellow dot points to the puzzle piece you need to grab next. If you're impatient, it's possible to ignore the explanations completely and just grab the blocks you need to proceed. At this point, though, Kano's teachings devolve into a game of paint-by-numbers, with little educational value but nonetheless impressive results. Taking the time to read and digest each step is advantageous. Only by understanding a block's function, and its relationship with everything else it's connected to, can you later manipulate it for yourself. Even if you don't, there's an immense satisfaction that comes from building something and truly understanding its inner workings. It's like an old grandfather clock — simple and mundane at first glance, perhaps, but magical if you've been inside and figured out how all of the cogs fit together. All of your handiwork, of course, takes physical form through the light board. One challenge teaches you how to create a stop motion animation, which might sound simple but is actually highly expressive given you can draw almost anything on each of the frames. There's a real sense of ownership that makes you want to hold the light board up and show it to a friend, just like you did as a child with crayon drawings. Another challenge ends with a music visualiser that ebbs and flows as you clap, talk or play music nearby. The utility is basic, but takes on new meaning when you've crafted it from scratch and set your favorite Spotify playlist humming in the background. There's a real sense of ownership that makes you want to hold the light board up and show it to a friend. Kano's team has managed to strike a tricky balance between complexity and accomplishment. Most of the projects can be completed within half an hour and contain less than a dozen steps. 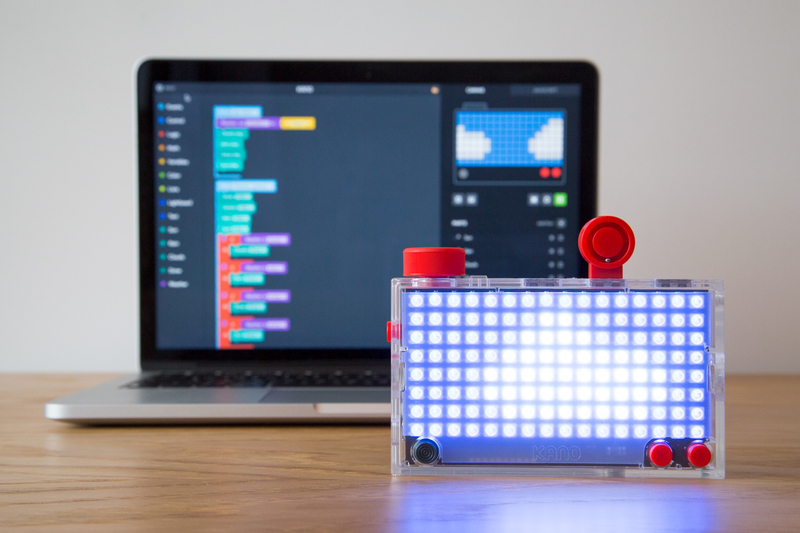 Higher-level projects will leave you with a rainbow-colored grid that sparkles when you clap or snap your fingers; or a tiny video game character that dashes across the screen as you push the Pixel Kit's joystick left and right. It's an addictive breadcrumb trail fueled by a basic leveling system that grants you experience points after each activity, encouraging you to save a project and immediately start the next. I question Kano's spoon-fed approach to teaching. It minimizes friction and stops people from giving up, but I wonder if the software would benefit from an extra degree of difficulty. Services like Codecademy often follow their online courses with a test: A digital roadblock that forces you to prove you've understood the class. Kano doesn't do that. It assumes you'll pay attention and pick up the most important programming concepts along the way. The thought, I assume, is that regardless of the ability, users are still working with technology in an interesting way, and that in itself should be considered a victory. After each activity, I would dive into my block-filled workspace and experiment by changing some of the pieces and their values. I was effectively self-testing and would set myself small goals to gut-check my understanding. At one point, for instance, the app showed me how to make a visualiser that moved from left to right. I wanted one that flowed vertically, however, so I switched out a few blocks and changed a couple of values until it was behaving to my tastes. I wonder how many people will do the same, and whether that sort of experience could've been formalised in the software. Once you've completed Kano's challenges, you're cut loose to build anything you like. All of the application's tools are available to you, including some rarely touched upon in the set activities. These include external "data" sources, such as weather forecasters, news publishers and even the International Space Station. You can use these however you like, though the obvious application is a breaking news ticker. Still, the possibilities in this mode are seemingly endless. If you've embraced Kano's courses, there's a good chance you'll be able to dive in and make something, no matter how rudimentary, that works. If you struggled with any of the prior instructions, though, or generally prefer a more guided experience, you might struggle. I think some suggestions or general ideas like 'Make something that will spruce up a party!' would have been a good way to encourage creativity. Alternatively, you can head to the "All Creations" tab and see what other people have made with their Pixel Kits. 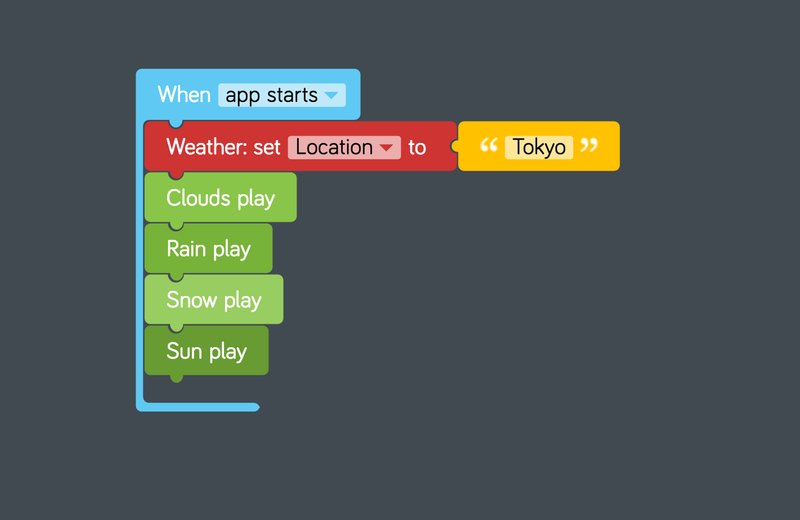 Kano gives you two different options: Send to Kit and Remix. The former is perfect for struggling coders like me because it puts the project straight on your light board. There's no need to replicate the creator's work or even try to understand how it was put together. You can simply transfer the project to one of three save slots and see what it looks like immediately. Put simply, you get all of the utility and none of the hassle. If you want to learn from other people, however, or try to improve their work, you'll want to hit that "Remix" button. Doing so will give you full access to their code, which you can then examine, change and save as a custom creation. It's a valuable feature that should help to extend the Pixel Kit's appeal long after purchase. The community should provide that longevity by pushing Kano's hardware and software in ways the company didn't imagine. Regardless of your skill level, you can then learn from these and improve your own work. Like the original Kano computer, the Pixel Kit was funded on Kickstarter. It was pitched in September last year alongside two additional kits, a camera and a speaker, which offer similar build-and-code experiences. The idea is that all three will work together, using complementary sensors that connect over USB. The Pixel Kit has a tilt sensor, while the Camera Kit comes with a tripwire sensor and the Speaker Kit, a gesture detector. Buy all three and you'll have a colorful collection of add-ons that can be used for downright weird and wonderful projects. The Pixel Kit was supposed to come out in December, followed by the Camera Kit in May and the Speaker Kit in July. Kano co-founder Alex Klein says the remaining two are still coming, but wouldn't commit to a release date for either. As such, it's hard to recommend the Pixel Kit on the promise of a larger ecosystem. Thankfully, it's still plenty interesting on its own, and I have faith the Kano community will grow and push the limits of the Pixel Kit until its siblings are released. 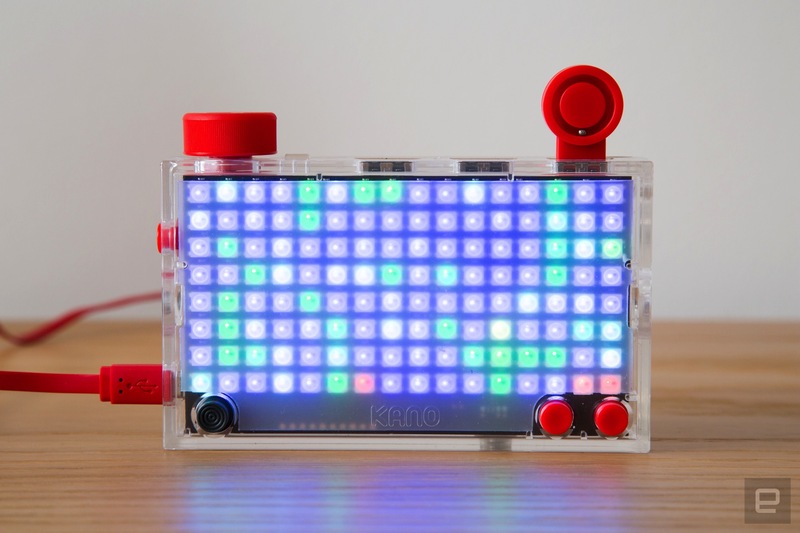 Kano's Pixel Kit won't teach you how to code -- not in the traditional sense, at least. It will, however, do a stellar job of communicating some of the programming theory that underpins your favorite devices, apps and services. It's a taste, or a glimpse, of what you'll be learning if you decide to dive deeper. The Kit, then, isn't a replacement for premium education platforms like Codecademy, but a bright, modern take on the classic construction kit; one that provides an authentic experience, from the physical assembly to your first line of code. It will delight and entertain, nurturing creativity in a way that outclasses most educational apps and physical computing sets. The Kit courses are educational, but you won't be a fully trained developer at the end of them. For some, the Pixel Kit will be a catalyst for further research and learning. If you're not one of these people, however, that's perfectly okay, because the projects are still fun to complete. As such, the light board is a worthwhile purchase at $80/£75, even if you have no aspirations to become a professional programmer. If you want to found the next DeepMind, though, just temper your expectations a little. The Kit courses are educational, but you won't be a fully trained developer at the end of them.